Instead of polishing the piece to a tee, Emilie Shapiro leaves a bit of texture from her tool marks. Operators, talkers, moves: So smooth. Your guy: He's got some dimension. 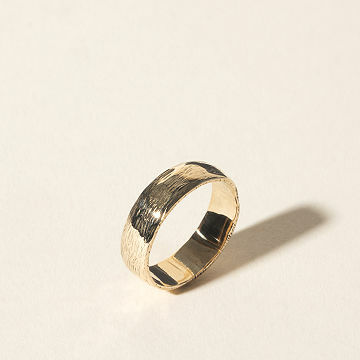 This 14k white gold men's ring by Emilie Shapiro does, too. Instead of polishing the piece to a tee, she leaves a bit of texture from her tool marks, both to preserve its craftsmanship and remind him that sometimes it's the bumps that make life beautiful. Handmade in New York. Care: Clean with a damp cloth or with mild detergent and a soft brush.